Looking for a team comp that strikes fast and strikes HARD? Check out this blitzkrieg style team composition that specializes in hitting opponents from where they least expect it from their blind spot. Combine it with a Shurelya's Reverie for extra enemy run-down action! Kai'Sa [Marksman] - Kai'Sa's insane range on her ultimate combined with her rapid invisibility gives her the ability to strike fast and strike hard. In a team fight, she needs minimal help as a result of her built-in self-peel, and her 1v1 abilities give her little reason to fear other champions. Galio [Mid] - Galio brings some powerful wave clear to this team alongside an excellent AOE defensive skill. This allows your team to tower dive freely without worrying about retaliation. He also brings in bulk, extra crowd-control, and anti-tower dive abilities via his AOE taunt. Taric [Support] - Arguably one of highest utility supports in the game, Taric's ultimate can be absolutely game-changing. He also brings in an AOE stun, giving his team incredible follow-up upon initiation. Nocturne [Jungler] - Nocturne is one of the cornerstone pieces to this team-composition. By using his ultimate, he completely masks your team's approach. Even if the enemies are grouped up, they won't be able to see what direction your team is coming from until you're basically on top of them. Kled[Top Laner] - The final piece of the puzzle, Kled is a powerful bruiser that has the ability to speed your entire team up to insane levels. This gives you the ability to slam into enemy teams from any area on the map. When combined with a sweeper or Nocturne ult, you can safely engage and drop in a Taric ultimate to make it a nearly guaranteed team fight victory. This team should focus on keeping Kled, Taric and Kai'Sa together. Galio and Nocturne have a much wider range and can sit back a bit to fool the enemy thinking that they can win the fight. Comboing Kled, Nocturne, and Taric together isn't always necessary, but synergizing the ultimates late game into funnel like Baron or Dragon pits is devastating. Countering this team really needs powerful disengage and some sort of super-safe split-pusher. Anivia [Mid] - An enemy team like this can easily get split apart with a well placed Anivia wall. While you still have to deal with Nocturne and Galio's dives, this will at least stall the Kled from running your team down for free. Kindred [Jungle] - Having an entirely invulnerable enemy team sitting on top of you is scary, but what if you have invulnerability of your own? Not so bad then is it? 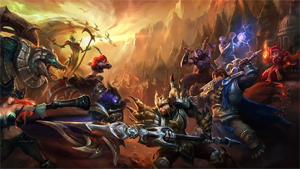 Tryndamere [Top] - Tossing another invulnerable champion into the mix, Tryndamere allows your team to have map pressure without being terribly worried about getting run down and massacred on the solo lane. Janna [Support] - Similar to Anivia, Janna's here purely for her disengage. She also has the added benefit of synergizing incredibly well with Kindred. Caitlyn [Marksman] - Although Caitlyn's traps won't do much after the enemy team's already on top of you, she can cut off an angle during sieges to prevent getting flanked. Overall, this counter team is decent, but a lacking in burst damage.